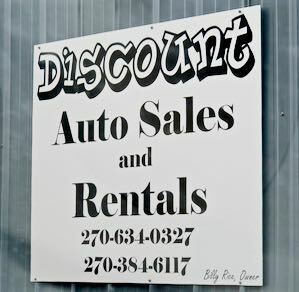 2017-04-26 - Discount Auto Sales, 4100 Knifley Road, Columbia, KY 42728 - Photo CM Advertising Photo . Discount Rent-A-Car has late model, reliable cars and vans for rent. Conveniently located at 4100 Knifley Road, Columbia, KY 412728. Billy Rice, owner. Monday-Friday, 8am-5pmCT. Saturday, 8am-12 Noon. Call 270-384-6117. Cell 270-634-0327. Home: 270-384-5233. God Bless America. See CM for automotive rentals and sales. Frequent changes. Check often.